Nestle's famous seasoning sauce is similar to East Asian soy sauce, except it doesn't contain soy. This seasoning sauce is primarily used for soups and sauces, but can also be used to prepare snacks, marinade sauces or to add flavor to dishes that include fish, poultry or meat. Maggi is made with salt, spices and pepper. 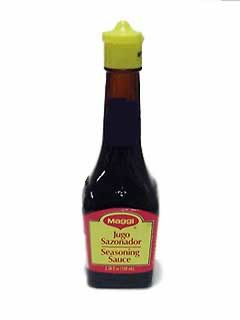 El jugo sazonador Maggi es muy similar a la salsa de soja, solo que no contiene soya. Este jugo sazonador es comunmente utilizado en sopas y salsas, aparte para prepar botanas, salsa para marinar o para darle sabor a platillos que incluyen pollo, carne o pescado. Maggi esta hecho con sal, especias y pimienta. I love this seasoning, especially when I cook Asian dishes. I used to buy this sauce at a store that was bought out and closed. When I use Soy Sauce, my hands and feet swell up from the sodium. Maggi Seasoning sauce doesn't do this to me and the flavor is much more savory! ConsHard to find in local stores. You shipped an order of one dozen Maggies Picante to me a couple of years ago. I would love to get more but it appears you no longer sell it. Can anyone out there let me know where I can buy it. I LOVE this stuff...I use it for almost anything savory. It is so delish in soups. Hard to find in stores so thank you so much MexGrocer for making it easy for me to get.